An Invasive Armyworm From The Americas Is Threatening Africa's Breadbasket : Goats and Soda Armyworms — caterpillars of a moth species — are creeping across ever wider swaths of southern Africa, munching their way through crops. A fall armyworm — actually a caterpillar — takes a bite out of corn and other crops. "Not until I saw my field did I realize how serious this issue is," says Banda. "I've been affected drastically because I spent a lot of money in buying seed, which is almost going to waste if [the fall armyworm] is not controlled. And I'm just hoping that God comes to our aid ... because this field is what I normally use to feed my family." Spraying what's left of his ravaged crop with insecticide, Banda hopes that within the limited planting season, he may be able to grow corn again. Corn is the basis for the region's staple food — a thick cornmeal porridge known in Zambia as nshima. Banda's new enemy is the Spodoptera frugiperda moth species from the Americas, which hit West Africa last year before migrating to the south of the continent. 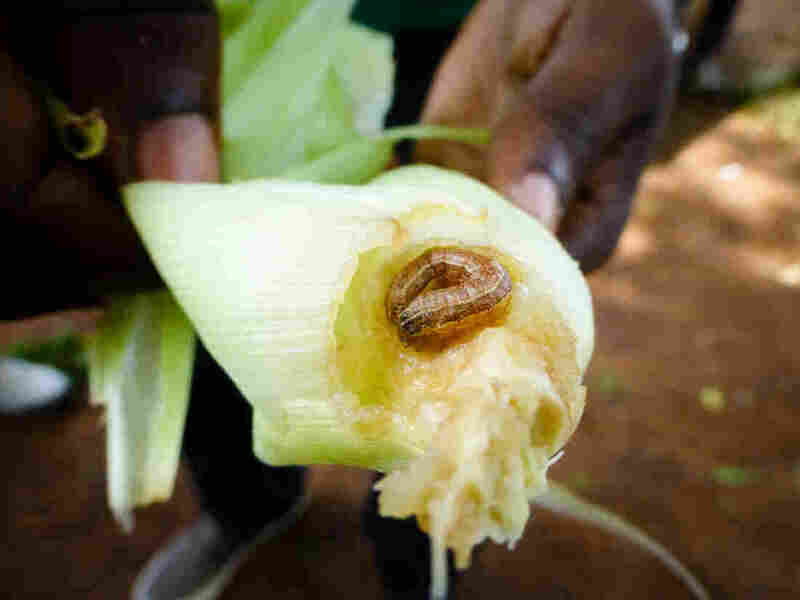 Scientists believe the armyworm caterpillar — or its eggs — may have traveled to the continent embedded in imported produce. "They can easily wipe out a whole crop," says Chimimba David Phiri, the southern Africa regional coordinator for the United Nations Food and Agriculture Organization (FAO). "They are second only to red locusts in terms of the intensity of damage they can cause, if not controlled. So, it's a very, very dangerous pest." South Africa, Zambia and Zimbabwe have seen an outbreak of the fall armyworm. Reports suggest the pest is present in three other countries in the region: Malawi, Mozambique and Namibia. Phiri says the key to stopping these caterpillars in their tracks is early detection. "It can only be controlled when the larvae are still very small, and they're under the leaves," he explains. "Then it is easy to use pesticides to control it. Now our problem is that about 40 million people are suffering from food insecurity from two years of drought. For us now to add another year of a bad crop, thanks to armyworm, it would be absolute disaster." The return of rains to southern Africa is part of the problem. The moisture has brought both the familiar African armyworm, a longstanding pest, and the fall armyworm caterpillar to the surface. And once the caterpillars morph into moths, they turn into an enemy air force. "It's a very migratory species, this new invader," says Kenneth Wilson from Britain's Lancaster University. "The caterpillar stage does the damage to the crop — maize, cereal crops, wheat, sorghum, millet and the like. And this fall armyworm, as it's called, also feeds on a range of other plant species. They're called armyworms because when they've finished eating the crop they're on, then they go looking for another one. So they look like an army marching in search of food." "But it's the adult moth that disperses," he points out. And that's why Wilson fears the moths may spread far beyond this region. "It's highly accomplished at flying," he says. "It does that in a series of hops. And it's very likely that the moths currently in Africa, if they have the same flightability, which they almost certainly do, they could make it to the Mediterranean and from there, on to other places." In fact, they could make it as far as Asia, Wilson thinks. Back in Zambia, the government says it has procured insecticides and a supply of early maturing seeds so farmers who've been struck by the pest can replant their crop. That relief may not come soon enough for David Banda. The farmer fears he may have to start buying cornmeal again for his family if the armyworm persists. "I will have to rely back on the shops," he says. "So the self-sustenance that I enjoyed, I'm likely going to lose it if this [pest] is not controlled." And the price of cornmeal could skyrocket if the armyworm devastates the corn crop. The U.N. Food and Agriculture Organization is holding emergency meetings in Zimbabwe this week to assess the armyworm invasion in southern Africa.